This example defines a class for storing data with a specific structure. Using a consistent structure for data storage makes it easier to create functions that operate on the data. A MATLAB® struct with field names describing the particular data element is a useful way to organize data. However, a class can define both the data storage (properties) and operations that you can perform on that data (methods). This example illustrates these advantages. For this example, the data represents tensile stress/strain measurements. These data are used to calculate the elastic modulus of various materials. In simple terms, stress is the force applied to a material and strain is the resulting deformation. Their ratio defines a characteristic of the material. While this approach is an over simplification of the process, it suffices for this example. This table describes the structure of the data. 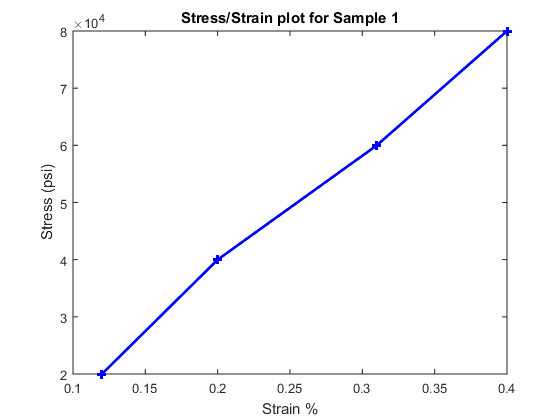 Vector of numbers representing the stress applied to the sample during the test. Vector of numbers representing the strain at the corresponding values of the applied stress. This example begins with a simple implementation of the class and builds on this implementation to illustrate how features enhance the usefulness of the class. The first version of the class provides only data storage. The class defines a property for each of the required data elements. would simply add a field to a structure. However, it returns an error when td is an instance of the TensileData class. A class is easy to reuse. Once you have defined the class, you can easily extend it with subclasses that add new properties. A class is easy to identify. A class has a name so that you can identify objects with the whos and class functions and the Workspace browser. The class name makes it easy to refer to records with a meaningful name. A class can validate individual field values when assigned, including class or value. A class can restrict access to fields, for example, allowing a particular field to be read, but not changed. Restrict properties to specific values by defining a property set access method. MATLAB calls the set access method whenever setting a value for a property. The Material property set method restricts the assignment of the property to one of the following strings: aluminum, stainless steel, or carbon steel. Add this function definition to the methods block. When there is an attempt to set the Material property, MATLAB calls the set.Material method before setting the property value. If the value matches the acceptable values, the function set the property to that value. The code within set method can access the property directly to avoid calling the property set method recursively. The constructor is a method having the same name as the class. If the value of a property depends on the values of other properties, define that property using the Dependent attribute. MATLAB does not store the values of dependent properties. The dependent property get method determines the property value when the property is queried. Therefore, it is better to calculate the value of the Modulus property only when its value is requested. Use a property get access method to calculate the value of the Modulus. The Modulus property depends on Stress and Strain, so its Dependent attribute is true. Place the Modulus property in a separate properties block and set the Dependent attribute. The get.Modulus method calculates and returns the value of the Modulus property. Define the property get method in a methods block using only default attributes. This method calculates the average ratio of stress to strain data after eliminating zeros in the denominator data. The TensileData class overloads the disp method. This method controls object display in the command window. The disp method displays the value of the Material, SampleNumber, and Modulus properties. It does not display the Stress and Strain property data. These properties contain raw data that is not easily viewed in the command window. It is useful to view a graph of the stress/strain data to determine the behavior of the material over a range of applied tension. The TensileData class overloads the MATLAB plot function. The first argument to this method is a TensileData object, which contains the data. The method passes a variable list of arguments (varargin) directly to the built-in plot function. The TensileData plot method allows you to pass line specifier arguments or property name-value pairs. Calculate Modulus when queried. For information about this code, see Calculate Data on Demand. For information about this code, see Simplifying the Interface with a Constructor. Restrict possible values for Material property. For information about this code, see Restrict Properties to Specific Values. For general information about property set methods, see Property Set Methods. Calculate Modulus property when queried. For information about this code, see Modulus Property Get Method. For general information about property get methods, see Property Get Methods. Add set method for Dependent Modulus property. For information about this code, see Modulus Property Set Method. Overload disp method to display certain properties. Overload plot function to accept TensileData objects and graph stress vs. strain. end statements for methods and for classdef.